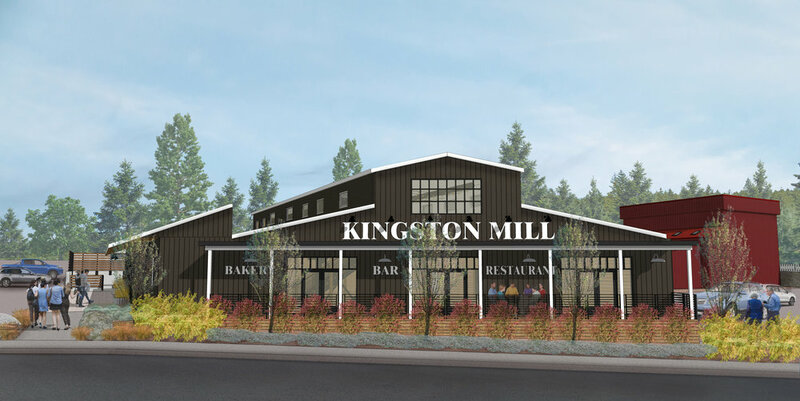 Design for the adaptive reuse of an old lumber yard with a classic industrial building form. 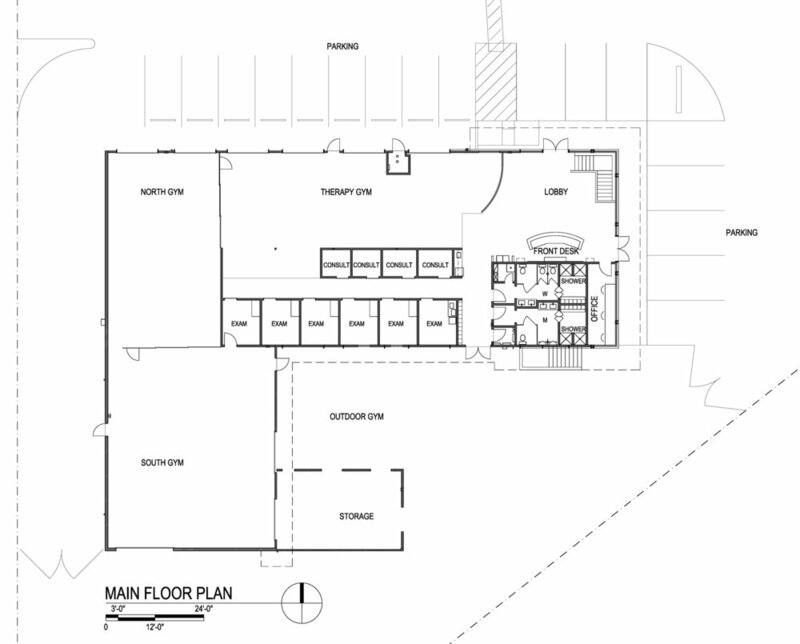 The open floor plan concept blends the restaurant and retail tenant spaces with common areas to create a vibrant scene characteristic of indoor markets. This project is currently under construction. 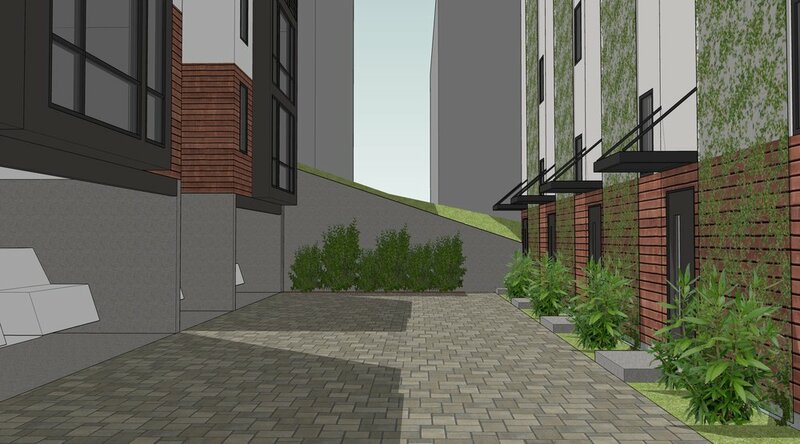 An existing 2-story apartment building built in 1960 will get a new third story for the property owner’s penthouse unit. 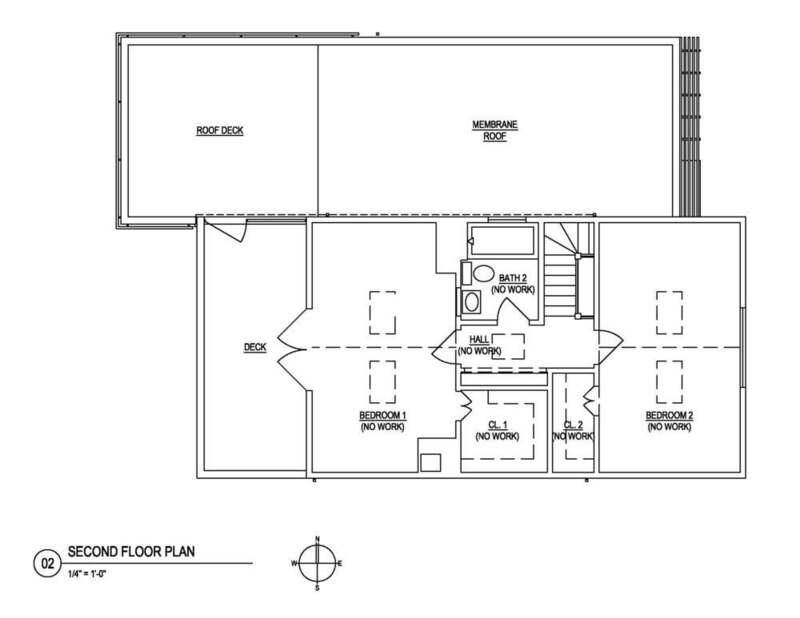 The new 1350 square foot top floor will have a master suite and a guest suite. The great room and its adjacent covered deck enjoy territorial views out the large south windows. This project is in the schematic design phase. 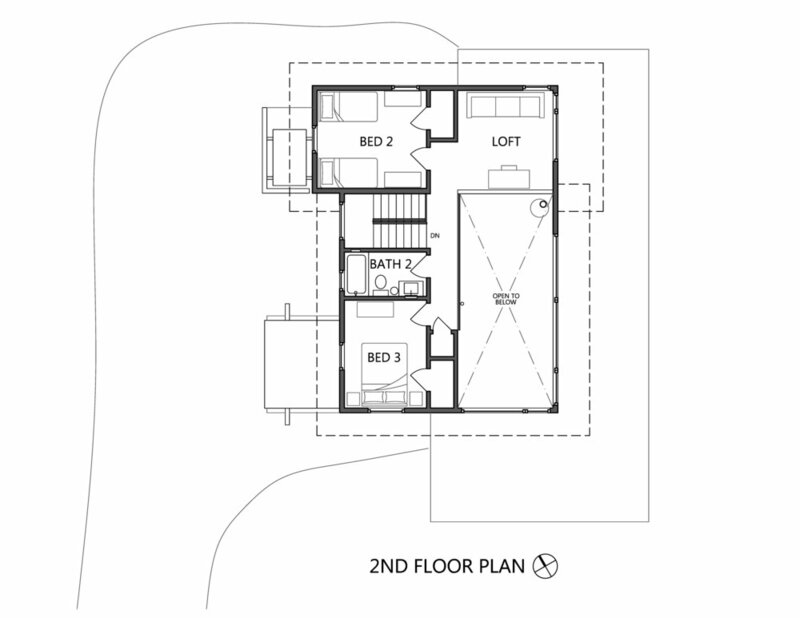 Four new townhouses on a suburban lot with interior autocourt leading to 2-car garages. 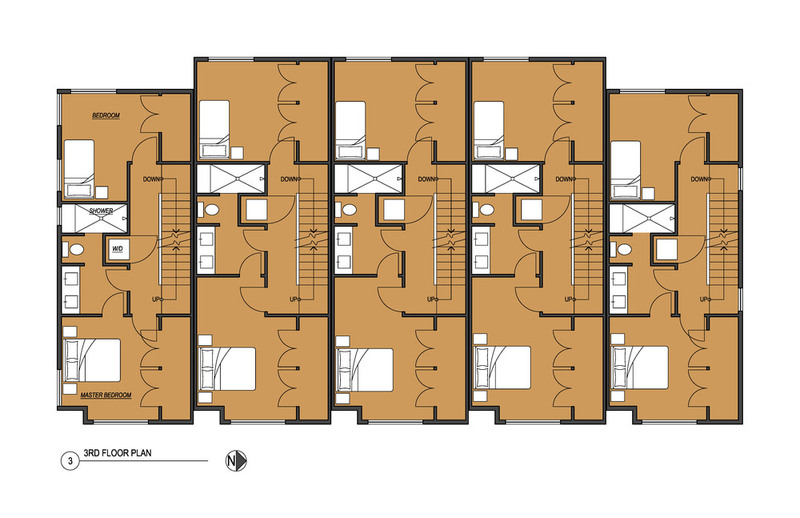 Each unit is about 1950 square feet with 4 bedrooms and 3-1/2 bathrooms. Balcony decks afford access to the outdoors right off the great rooms. This project is in the schematic design phase. Design for a new single family house on a suburban lot at the end of a cul-de-sac. 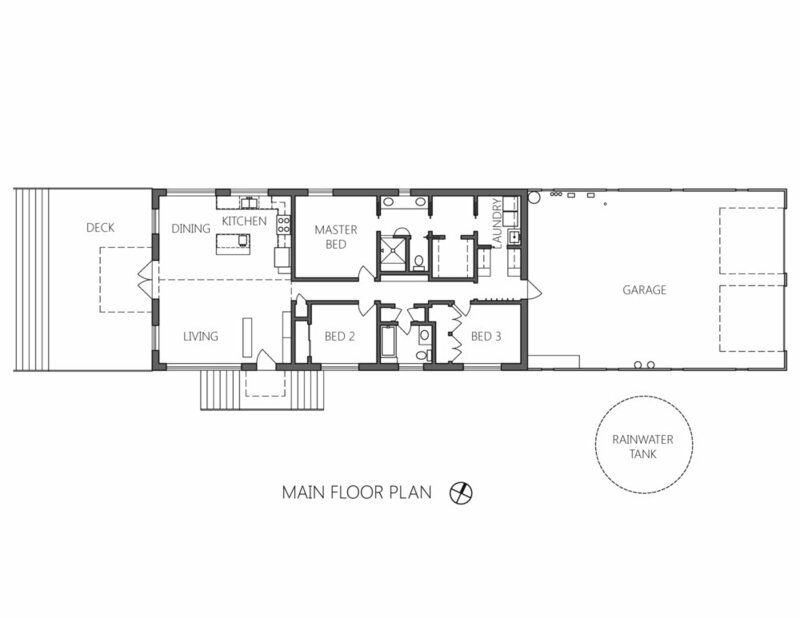 4700 square feet, 5 bedrooms, 5 bathrooms, with a 600 square foot Accessory Dwelling Unit. 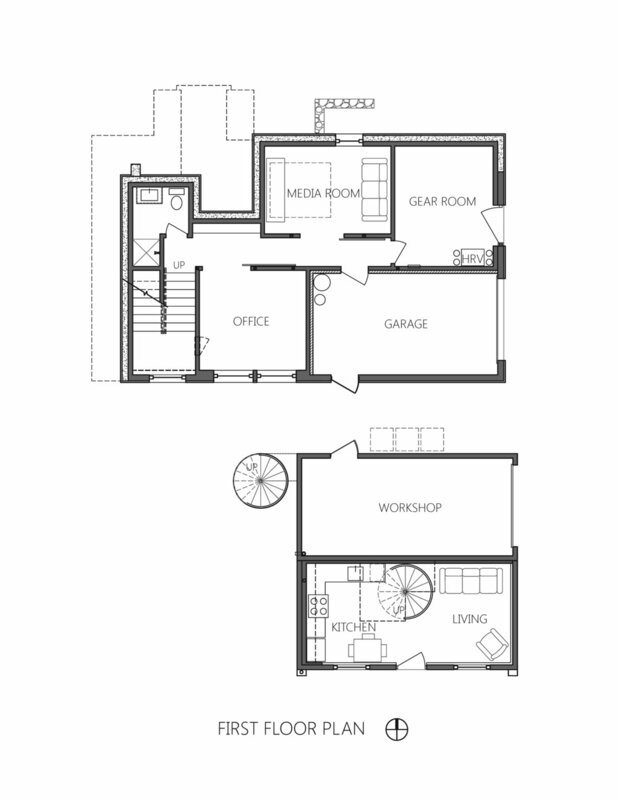 A residential elevator will bring homeowners and guests up to the top level great room with its views to the southeast. Exterior siding to be stained cedar boards with rusty steel panels for an accent. 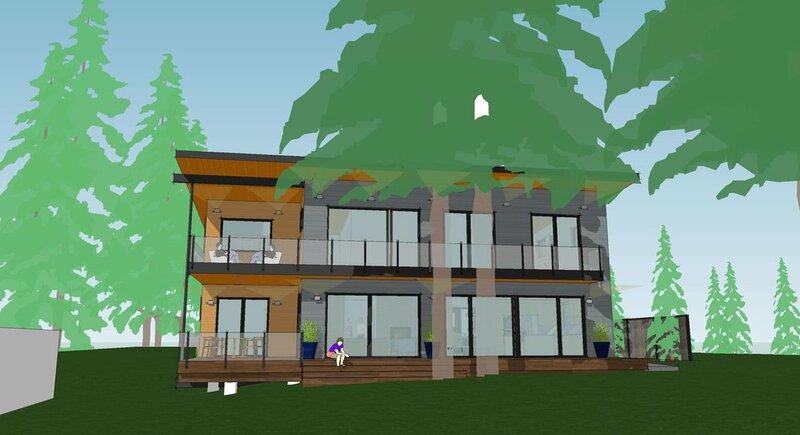 Walls will be R-35 Structural Insulated Panels, windows will be triple glazed, and the roof has room for a huge 14kW solar array. This project is in the schematic design phase. A new 3-story house on a small corner lot in the city. 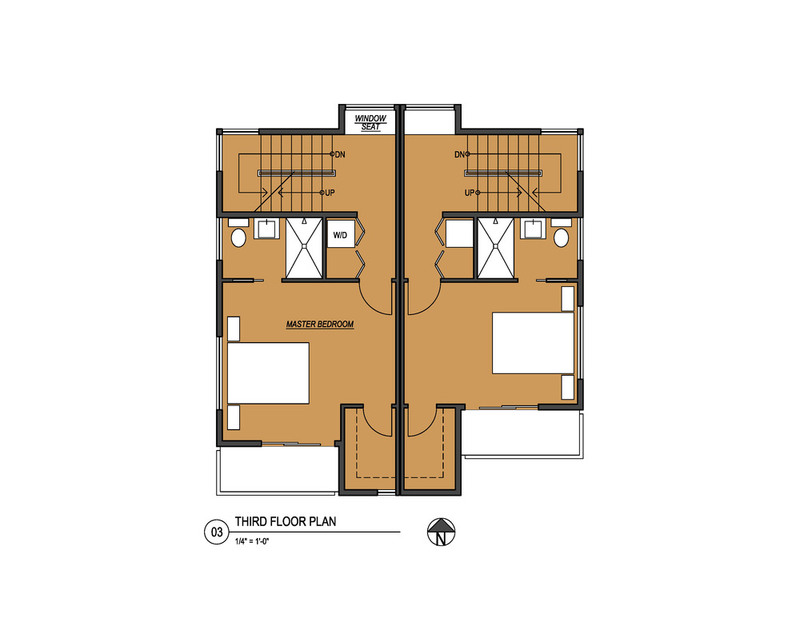 1900 square feet with 3 bedrooms and 2-1/2 bathrooms. 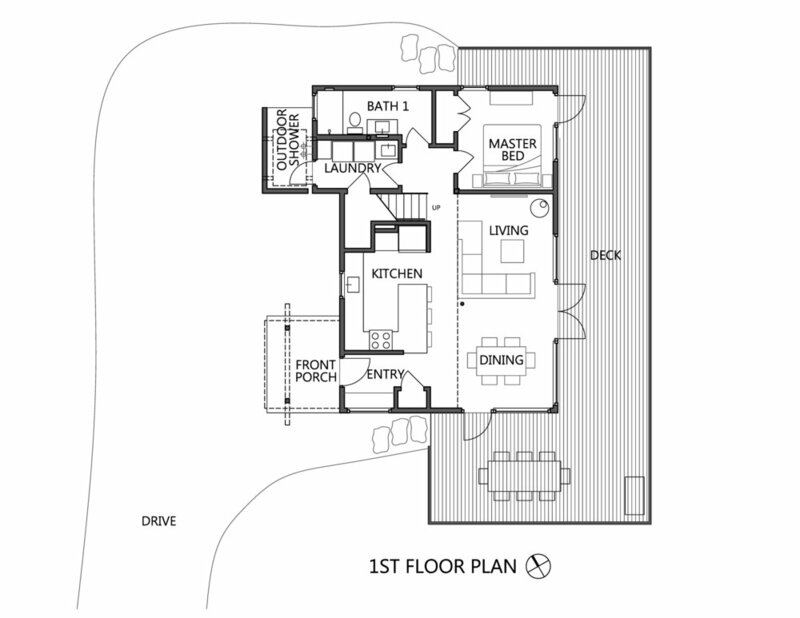 The great room and its balcony deck are on the top floor to enjoy views of both downtown Seattle and Mt. Rainier. Locating the front porch at the middle floor makes the entry more inviting. This project is under construction as of April 2019. 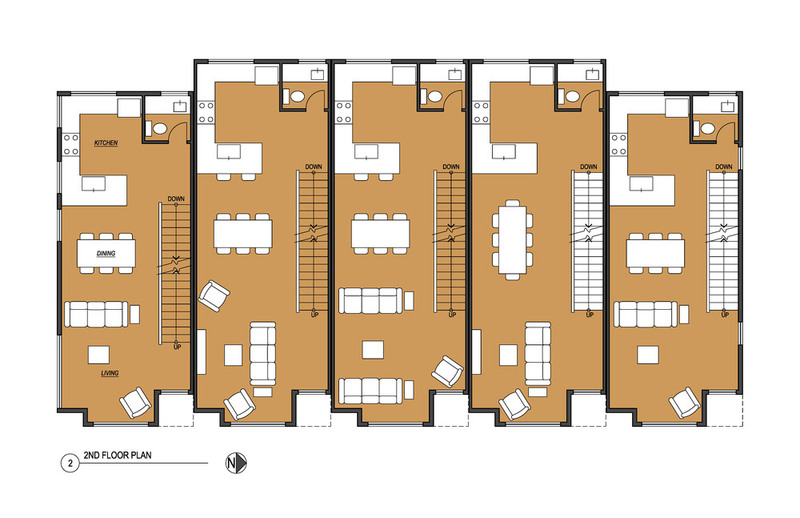 Constrained by zoning code, this project was only able to add 119 square feet of new footprint. So the homeowners gave a third of their existing family room to create a new Accessory Dwelling Unit for grandma to occupy. 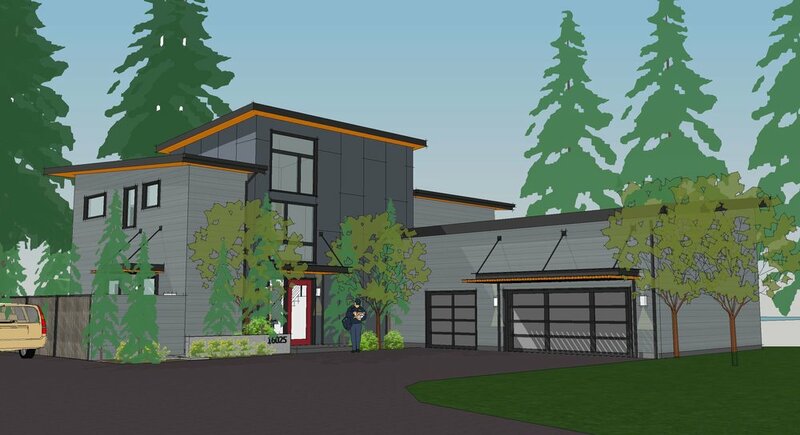 Connected by an interior door to the main house, but with its own exterior door for independent entry, the ADU allows the family to easily get together or remain separate as needed. 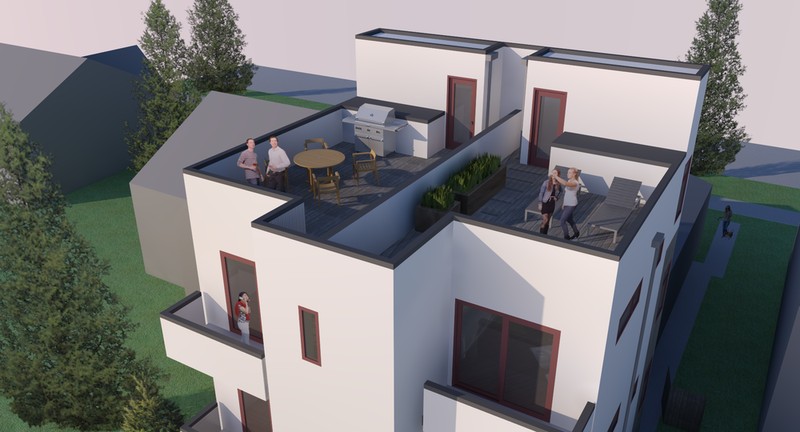 This project in the schematic design phase. VELOCIPEDE architects designed this cabin for a professional couple and their two young sons as a weekend retreat – a place to unwind from their hectic life in the city and focus on family. Thoughtfully perched on a steep hillside overlooking a small valley outside the town Cle Elum, Washington, this budget-conscious 1,400 square foot cabin has three-bedrooms, two-baths and a bonus loft/play area. 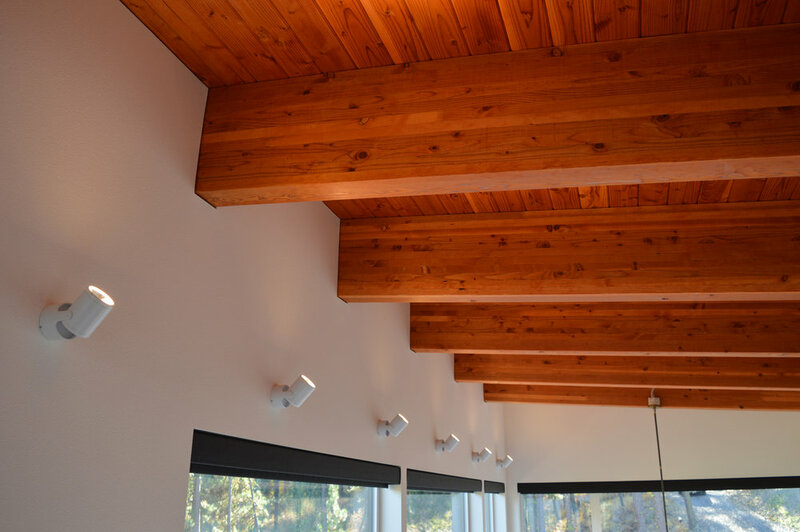 The main living/dining room is a double-height volume capped with an exposed wood ceiling supported by wood beams, all sustainably harvested FSC lumber. The property is in a Fire-Wise community, requiring all exterior finishes to be carefully chosen for fire resistance and surrounding vegetation to be cleared. High on the owners’ wish list were a connection to nature, a large deck for entertaining, and a place for the children to take off their muddy shoes after romping in the woods. 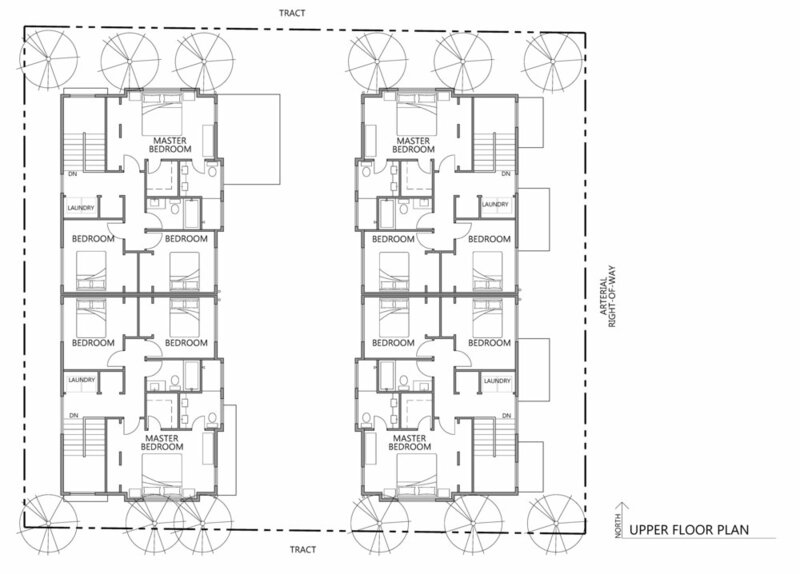 New 5-unit rowhouse development LR1 zone. Street facing units have territorial views to west. 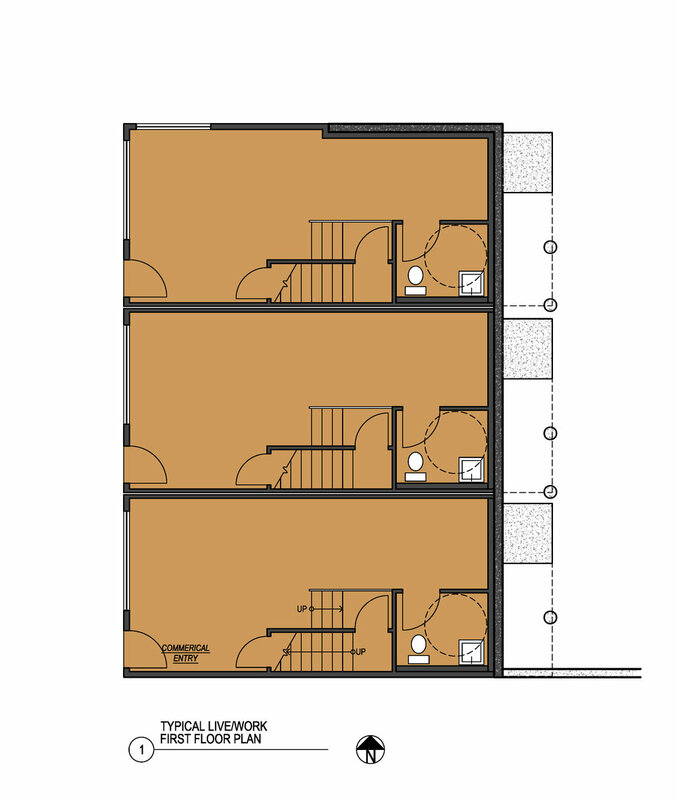 Tenant improvement for a microbrewery and taphouse in a 3600 ft2 existing building in Ballard. A local favorite for its tasty brews, laid back atmosphere, and large beer garden. Riffing on the owner's established mid century theme, VELOCIPEDE designed the service bar, seating and equipment layout, interior materials and lighting, and obtained their building permit. 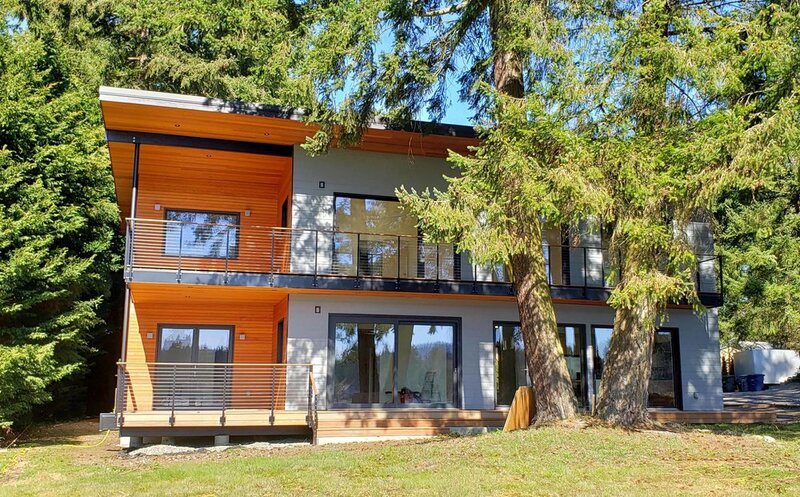 New Passive House on a hilltop in Carnation, WA. 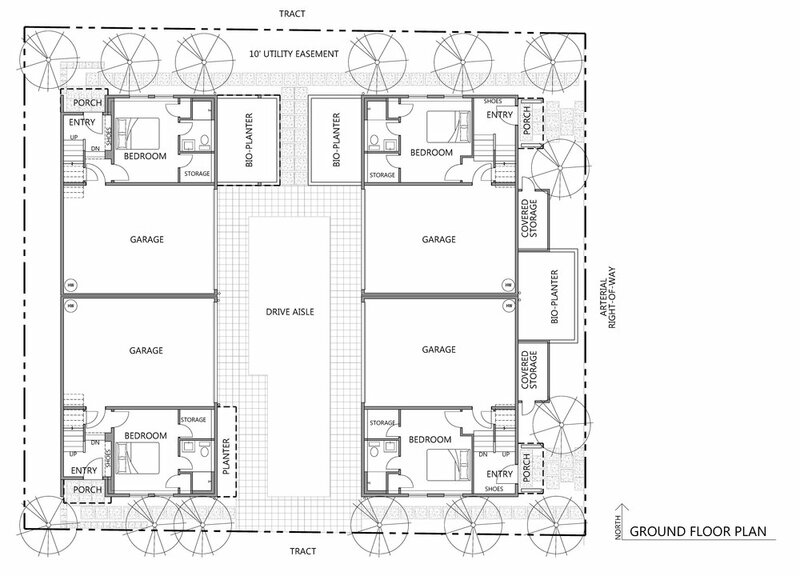 Three bedrooms, two baths with an attached four-car garage. The aesthetics were inspired by rural barns which created an efficient building form to achieve the Passive House standard. This project was built by the homeowners themselves over the course of five years. Net positive energy is achieved through super insulation, triple glazed windows, rigorous air sealing, a Heat Recovery Ventilator, solar hot water, and PV panels. The 8,800 gallon tank collects rain water from the roof to supply 100% of potable uses inside the house, the first house in King County (greater Seattle) to do so. Low toxicity materials were used throughout the building, most lumber is certified FSC, and the building is a Certified Passivhaus by PHIUS+. 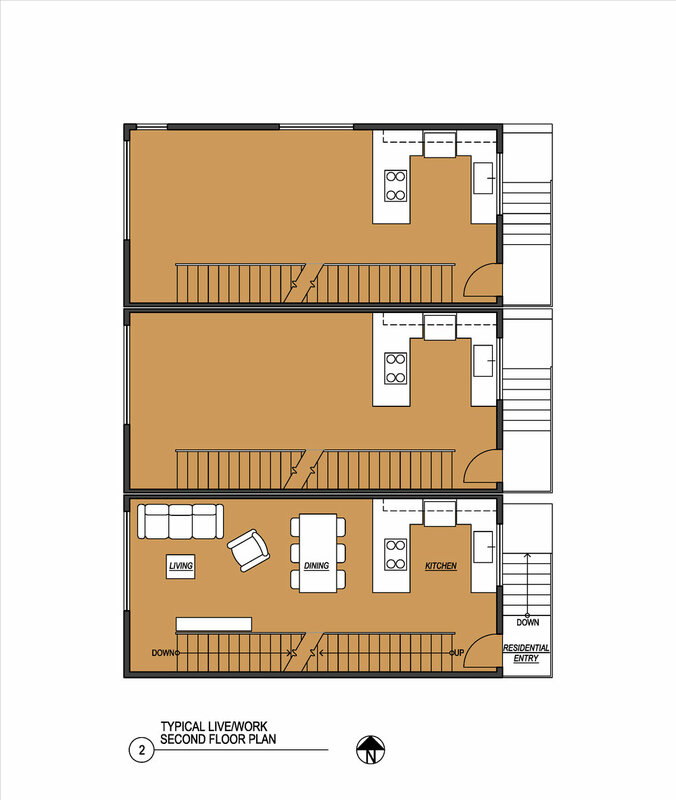 Tenant improvement for a new 4030 ft2 gourmet beer tavern in Seattle's South Lake Union neighborhood. 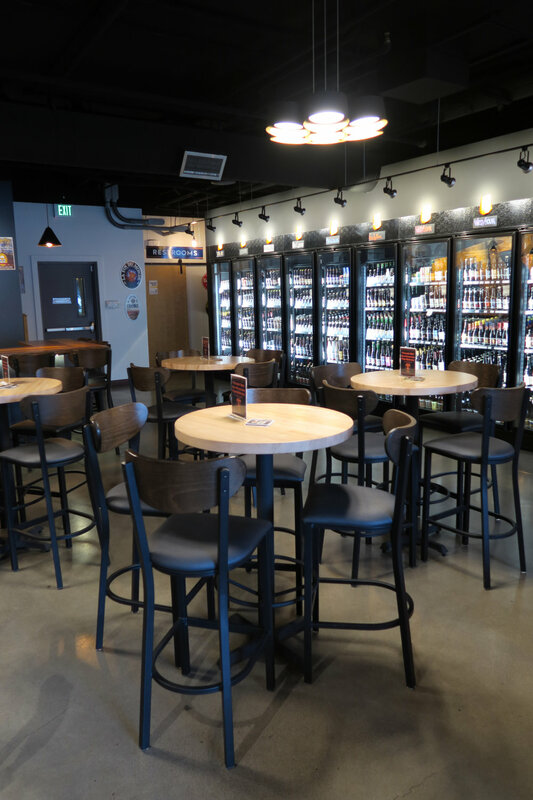 Brew connoisseurs love the choice of 50 draft taps and 27 doors of bottles, all carefully selected by the owners. The tavern's namesake is a glass ideally shaped to appreciate the taste of quality beer. 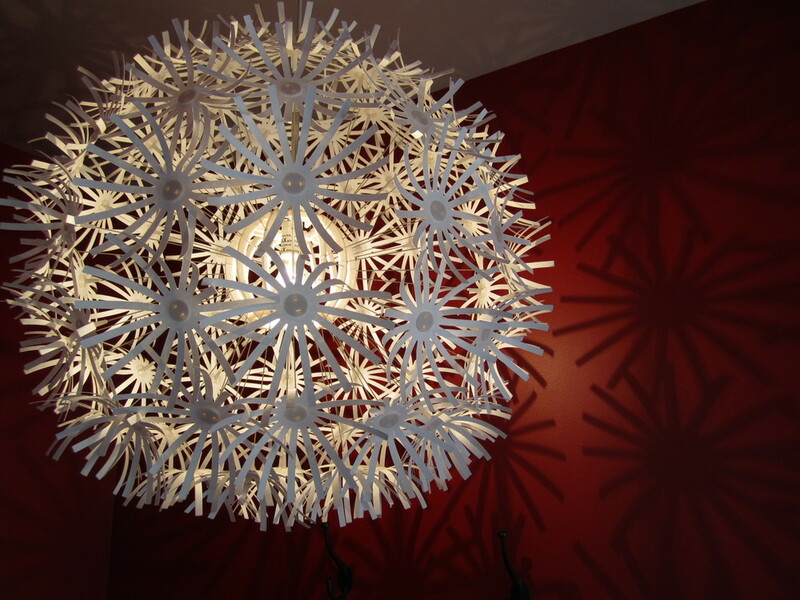 VELOCIPEDE advised on selection of the tenant space, designed the seating layout, interior materials and colors, and lighting. 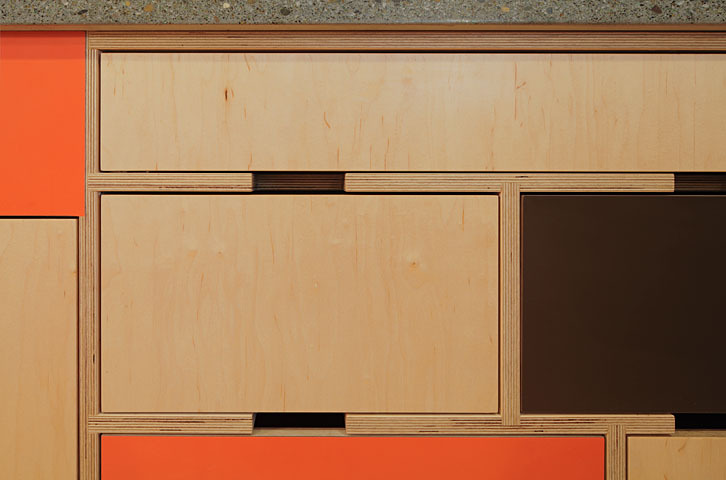 The focal element is the array of taps set in a copper lined recess, with menu screens above. 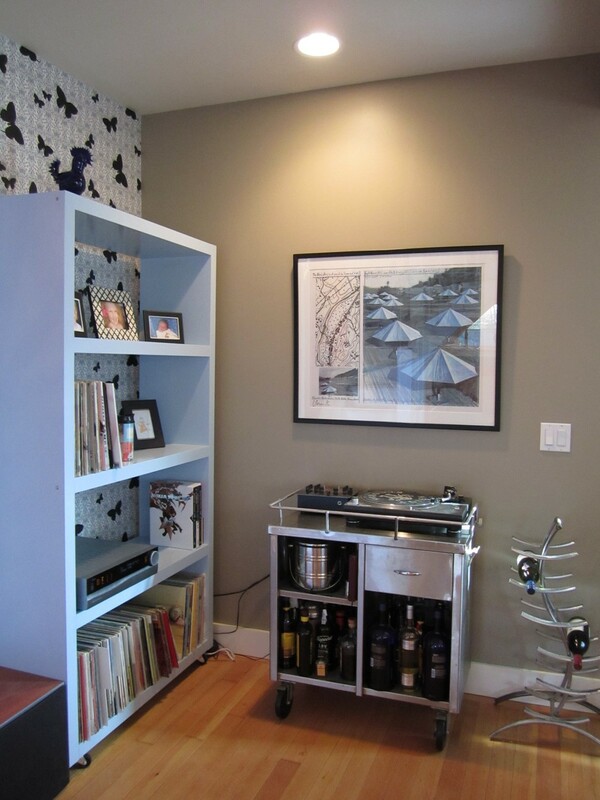 The bar top is a slab of black limba wood. 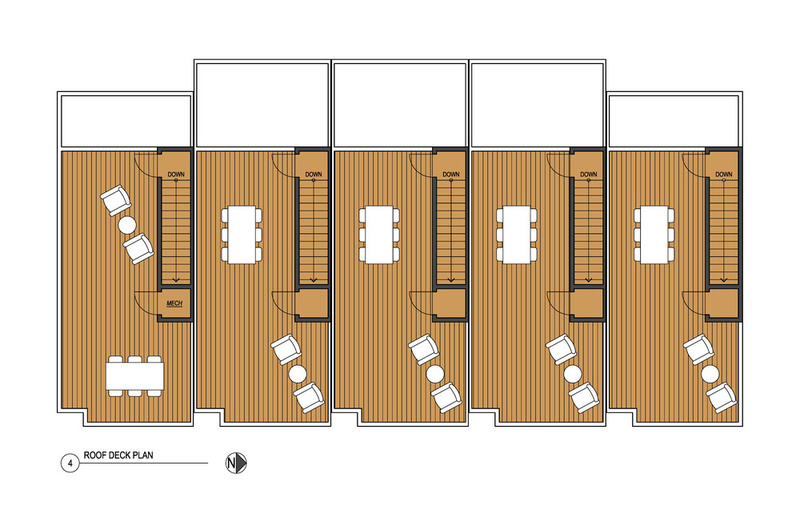 New 5-unit row house on new lot boundary adjustment in LR2 zone. 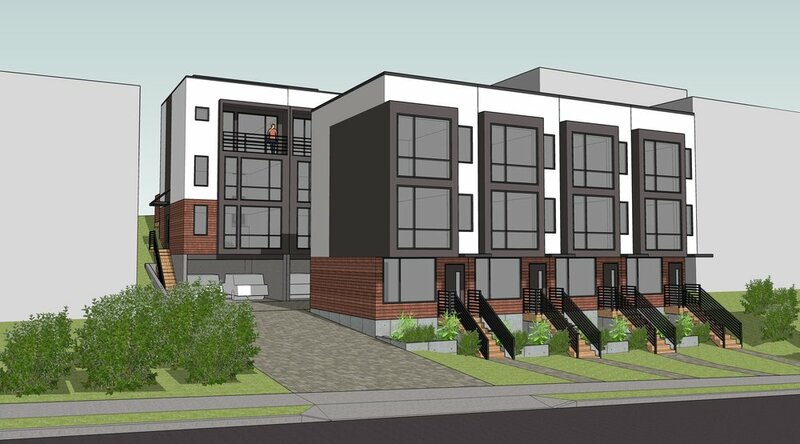 New 2-unit townhouse in back yard of existing single family house in LR2 zone. A combination of physical therapy clinic and fitness gym, this growing business sought a larger space and a stand alone building to increase its identity in Lynnwood WA. VELOCIPEDE helped the client evaluate several properties before guiding them through the permit process at the location they bought, a former auto repair shop. The tall ceilings and wide garage doors were features worth keeping, but otherwise we completely transformed the 10,000 ft2 space. In the basement is a tranquil yoga room with bamboo flooring. The clinic exam rooms each have a sliding barn type door, and the reception desk is finished with rough wood boards. The overall aesthetic is natural and healthy rather than the glitz or industrial look found at most health clubs. This 1962 house in the Magnolia neighborhood of Seattle was aging and dated, but occupied a terrific waterfront site and had good modern "bones." 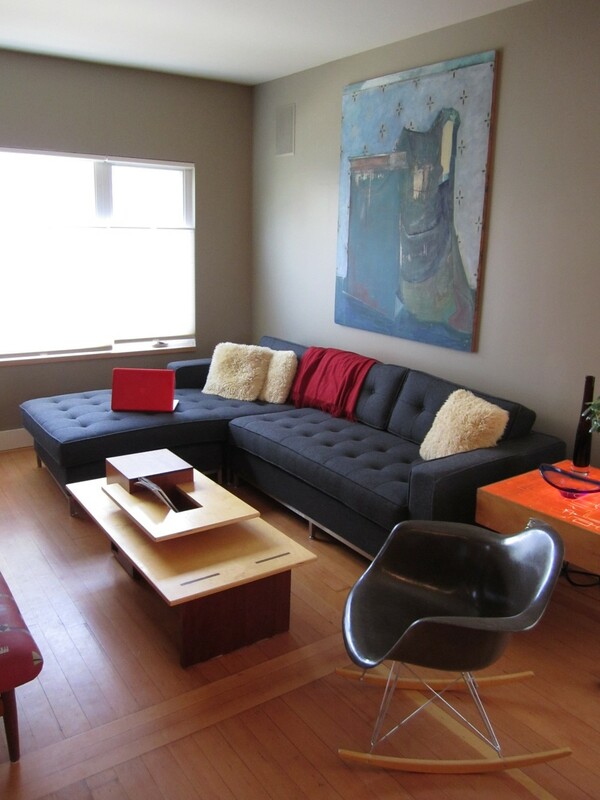 The existing 2-bedroom house was remodeled inside and out without adding any space. An existing guest house was demolished to make way for a new two car garage. A new stair was cut into the center of the house, connecting the upstairs great room with the downstairs den. The stair was designed and crafted to make the treads appear to float. 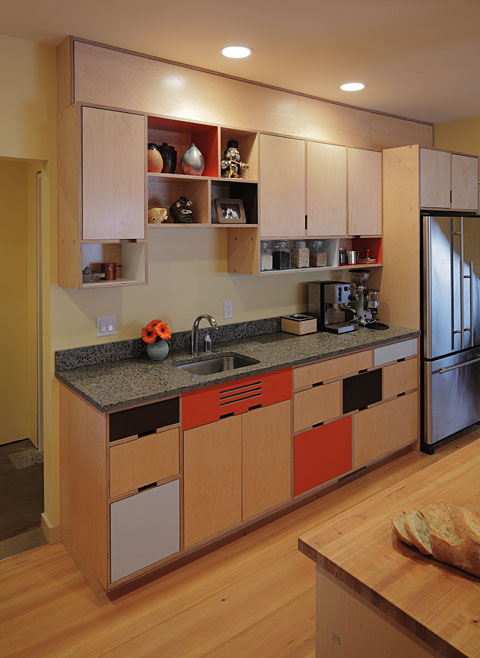 New wenge cabinets and new stainless steel appliances updated the kitchen in its existing location. A new folding glass door opens the entire south wall of the kitchen to the entry courtyard in good weather. In the master bedroom, the bed was reoriented to face the water view, with privacy afforded by new shoji panels when desired. The master bathroom was fitted with a two-person soaking tub, a glass shower stall, and slate flooring. Built in 1909, this house was a modest 617 square feet per floor over a crawl space. 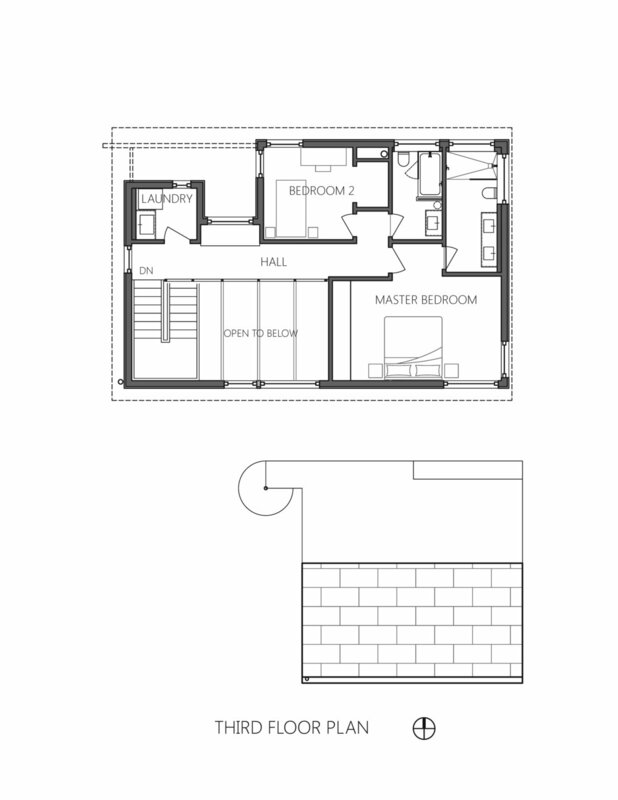 After living in the home for 3 years, the homeowners were ready to add a guest bedroom/study and mud room, as well as dramatically rework the kitchen in a modern aesthetic. 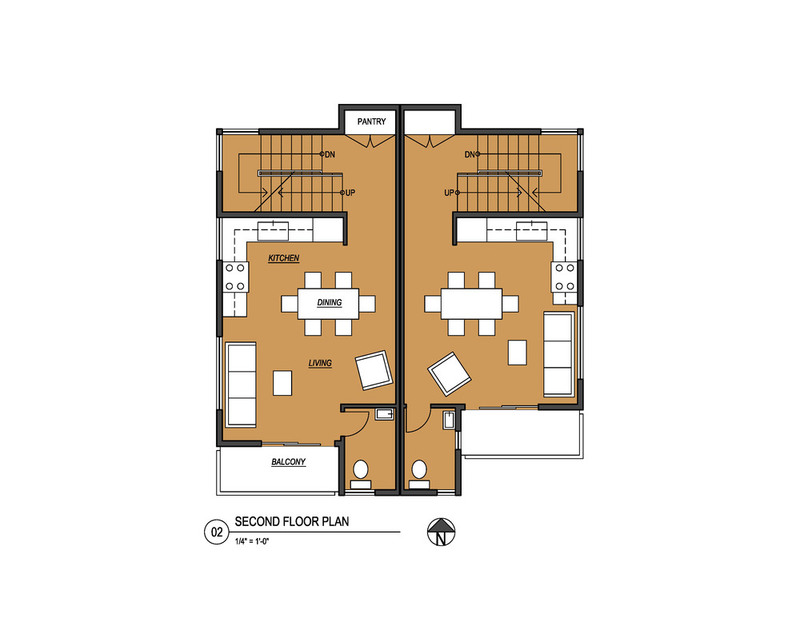 A 10-person table is planned for dinner parties. The existing house had no insulation at all for its first 100 years! So we sealed air leaks and installed cellulose insulation throughout the lower level. Inside, low toxic Yolo paint and recycled gypsum board were used throughout. Topping the new addition is a planted roof to replace the garden lost beneath the addition footprint. Certified Built Green 3 Star.